30" x 40" . OIl on canvas.I found this beauty out on Jackson Creek Road in Bozeman, Montana and completely fell for it! However, it was originally red. So, I decided to make it white and give it a bit of an americana flair with the aged american flag and the old farmall parked outside. 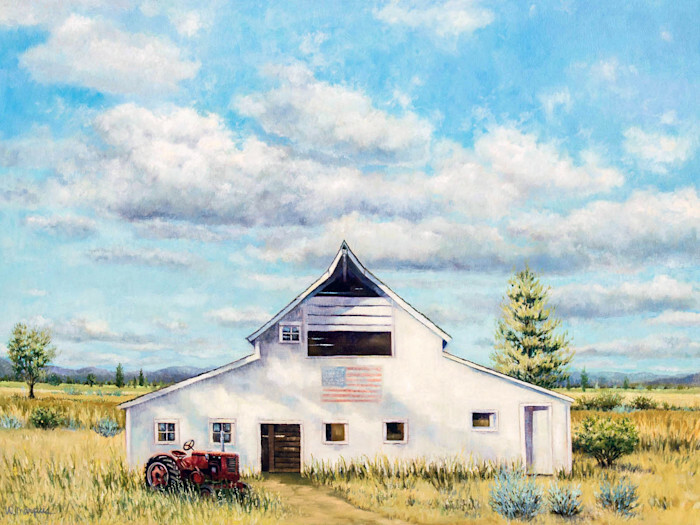 A barn is a haven in times of in war…in times of sorrow. A barn is a building built together. When the crops are harvested, the barn still stands. Oil on canvas. 30 " x 40 "
I found this beauty out on Jackson Creek Road in Bozeman, Montana and completely fell for it! However, it was originally red. So, I decided to make it white and give it a bit of an americana flair with the aged american flag and the old Farmall parked outside.